School starts for us next week and I am not sure what emotions to feel about it. It is always so nice getting them back into a routine, but it brings a super busy schedule with it. Trying to juggle homework, sports, dance, tumbling, makes it a little chaotic around our house. This is why I am the queen of easy-to-make delicious meals. If I am making something quick for my family it usually involves one pot, 30 minutes or less, and lots and lots of cheese. 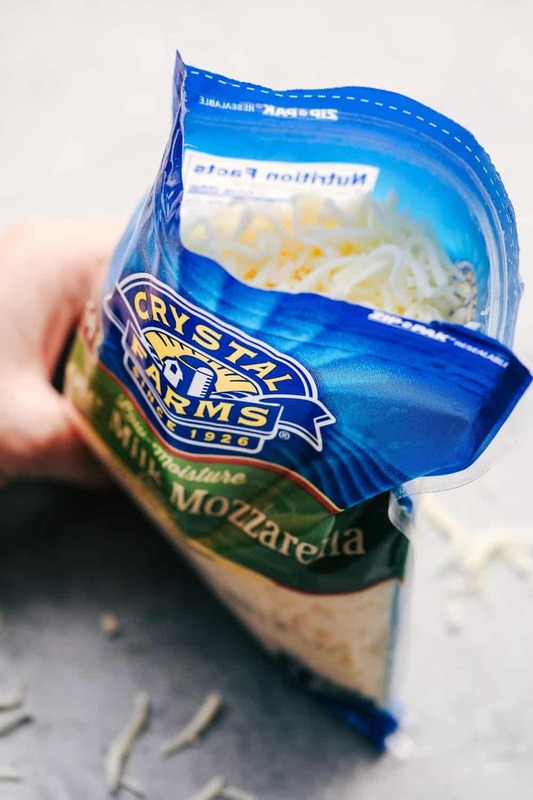 We love Crystal Farms Cheese at our house and I love using it in the recipes that I create. Our requirement is that it has to be high-quality, ooey gooey, and delicious, and Crystal Farms cheese is just that. 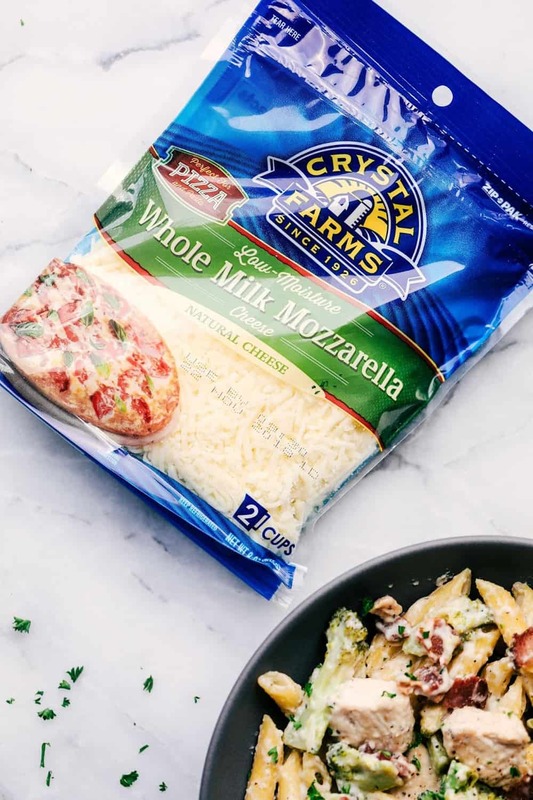 The Whole Milk Mozzarella Shreds is made with 100% whole milk and is rich, buttery, and has superior meltability. It only has 5 ingredients and it is a great source of natural, healthy fats. It is the perfect cheese to use in the recipe that you are creating! 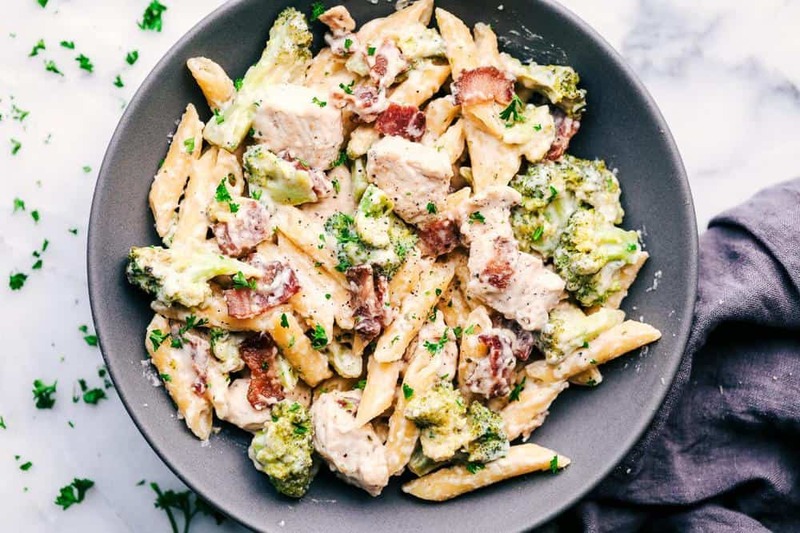 HOW DO YOU MAKE CHEESY CHICKEN, BACON, AND BROCCOLI RANCH PASTA? To start, in a large skillet, cook your bacon until crisp. Remove with a slotted spoon and set aside on a plate. Next, add the chicken, cook until brown and no longer pink. Set aside on a plate. Add the chicken broth, half and half, ranch packet and whisk until incorporated. Add penne pasta, and broccoli. Bring to a boil, and cover and simmer about 10 minutes until broccoli and pasta is tender. Add the chicken, bacon, and cheese, and stir until cheese is melted and heated through. WHAT ARE SOME TIPS FOR COOKING PASTA IN ONE POT? Make sure that the pasta is fully submersed in the liquid. You will need to transfer to a smaller pot if it isn’t. Cook with a lid over the top. This helps keep more liquid in as it boils. Cook for about 10 minutes or until the pasta is tender. We have used Rotini and also Linguine. You can use whatever pasta your family prefers. WHAT IS A RANCH SEASONING PACKET AND WHERE CAN IT BE FOUND? It is a dry seasoning packet located on the aisle with the salad dressings. If you live somewhere where this packet isn’t easily accessible, you can find recipes online to make it at home. This meal was devoured by my family immediately. My son said it was one of the best, and cheesiest recipes that I have made! All of the flavors come together so well in this one pot dish. Ranch flavor, bacon, chicken, and broccoli. We loved this meal and it is the perfect meal for busy school nights. You will love this easy, cheesy dish just as much as our family did! In a medium sized skillet, cook the bacon until crisp, remove with slotted spoon and then set aside on a plate. Add the chicken, cook until brown and no longer pink. Set aside on the plate. Drain the remaining grease. Add chicken broth, half and half, dry ranch seasoning mix to the skillet and whisk. Add the penne pasta and broccoli then bring to a boil and cover. Simmer for about 10 minutes or until the pasta is tender. Stir in the cheese and chicken and stir until cheese is melted and heated through. This post was sponsored by Crystal Farms Cheese. I love working with brands that I am passionate and use in the kitchen for myself. All opinions expressed are my own. I am almost afraid to ask, but what are the calories, etc. 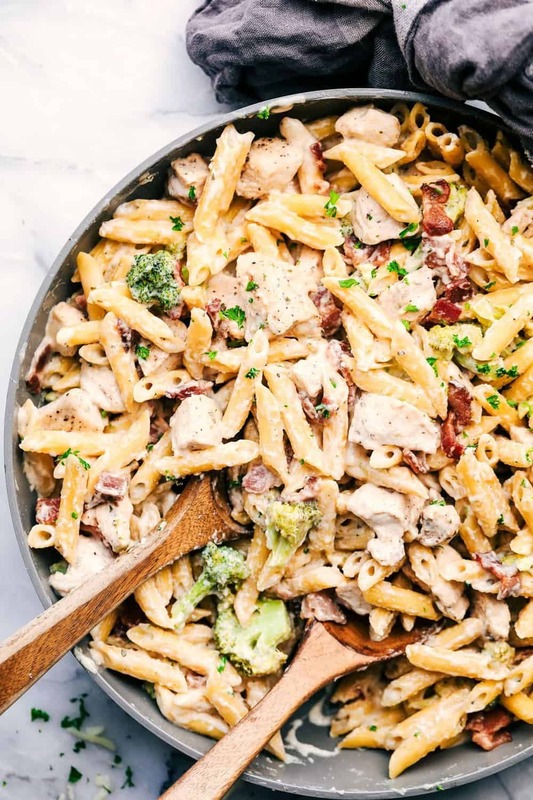 of the bacon, chicken and cheese recipe? It sounds too good to be true!!! sounds yummy- but how many will this feed? So,,to be clear, we’re using the bacon drippings, correct? This sounds define, I’m on it! Thank you. Everything’s better with bacon and Ranch! I made this for our dinner tonight. It has a wonderful flavor, but it was quite watery. I thought maybe the pasta would take care of most of the liquid as it cooked. However, when that didn’t happen I began to think maybe the cheese would help out, but that didn’t help either. I will definitely make this again with some adjustments.